Our discipline expertise has enabled us to offer a highest quality range of Sanitary Napkin Burning Machine with Minimum Cost. By using this Napkin Burning Machine easily burn the soiled Napkin waste thoroughly. We have gained a most appreciated acclaim in the industry for Manufacturing, Trading and Wholesaling of PCB Norms Followed Napkin Burner with good Quality but Cheap Cost to our honoured customers. Reduce absence of school and college students. Note: Above mentioned price is the starting price of the product. Prices may be varied according to the size. Our firm has acquired a distinguished market position in manufacturing, supplying and wholesaling a broad array of Napkin Burner has High Quality with Minimal Cost. Smallest in size, the offered incinerator is used for undertaking the burning of sanitary napkins in an efficient manner. Being compact in size, these incinerators can be easily placed on the floor, in an open area or can be mounted on the wall of washrooms. Fabricated under the guidance of UNICEF our offered machines ensure to function properly. SARA EQUIPMENTS - We have gained a most wanted credit in the industry for Manufacturing, Trading and Wholesaling Regular Sara Equipments - We have earned a sterling reputation in the industry for providing Regular Pad Napkin Burner to our revered patrons. The offered sanitary napkin incinerators are used for incinerating the used sanitary napkins to produce negligible ash. These sanitary napkin incinerators are environmentally friendly and are operated with electricity. We specialized in handling customized orders owing to our dexterous professionals. Besides, these Sanitary Napkin Incinerators are available with us in varied specifications. Saving water and healthy environment. 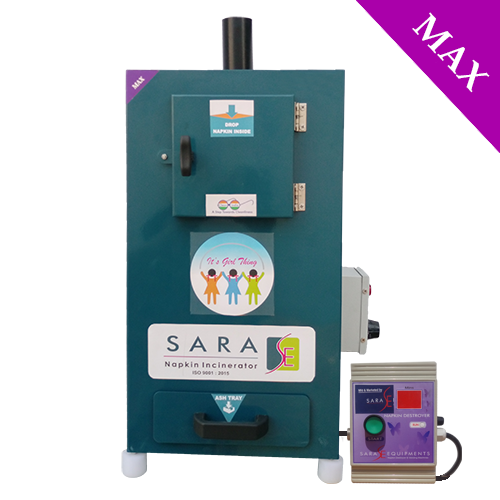 Sara Equipments - Our concern has acquired a distinguished market position in manufacturing, supplying and wholesaling a broad array of College Napkin Incinerator with Latest Design which exhibits best and High Quality but Low Cost. Being compact in size, these Napkin Burning machines can be easily placed on the floor, in an open area or can be mounted on the wall of washrooms. Our Napkin Disposal Machines are fabricated under the guidance of UNICEF our offered machines ensure to function properly. • Easy removing Ash collecting tray ensures cleanliness. • Big door open makes it convenient to load used napkins. • The heater of high power makes the temperature rise quickly and improves the efficiency. • Double stage computer programmed control panel gives Long life for the heater and reduce the electricity bill. • Available with the size of 50, 100, 200 and 500 napkins per day. • Note: Above mentioned price is the starting price of the product, prices may be varied according to size and structure. Sara Equipments - Our concern has acquired a distinguished market position in manufacturing, supplying and wholesaling a broad array of College Napkin Incinerator which exhibits best and High Quality but Low Cost. Being compact in size, these Napkin Burning machines can be easily placed on the floor, in an open area or can be mounted on the wall of washrooms. Our Napkin Disposal Machines are fabricated under the guidance of UNICEF our offered machines ensure to function properly. Note: Above mentioned price is the starting price of the product, prices may be varied according to size and structure. 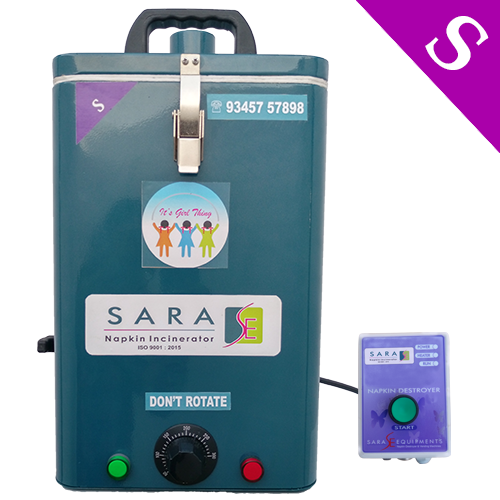 Sara Equipments - We have earned a sterling reputation in the industry for providing Hygienic Sanitary Napkin Burning Machine to our revered patrons. 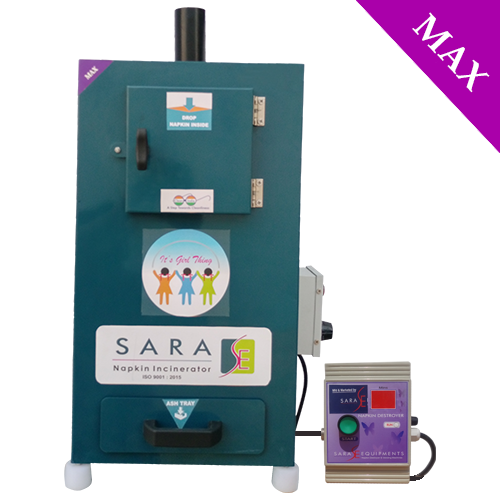 The offered sanitary napkin incinerators are used for incinerating the used sanitary napkins to produce negligible ash. These sanitary napkin incinerators are environmentally friendly and are operated with electricity. We specialized in handling customized orders owing to our dexterous professionals. Besides, these Hygienic Sanitary Napkin Burning Machine are available with us in varied specifications. Our offered Sanitary Napkin Burner is manufactured using most Quality Materials with Cheap cost and modern technology under the guidance of business professionals. In Addition to, provided Pad Incinerator is appreciated for its high quality, long working life and eco-friendly. We provide this Napkin Incinerator to our customers in different sizes, designs, and specifications. Our firm has acquired a distinguished market position in manufacturing, supplying and wholesaling a broad array of Pad Burner Napkin Disposal Machine has High Quality with Minimal Cost. Being compact in size, this Napkin Disposal Machine can be easily placed on the floor, in an open area or can be mounted on the wall of washrooms. Fabricated under the guidance of UNICEF our offered machines ensure to function properly. Sara Equipments - Our discipline expertise has enabled us to offer the highest Quality range of Napkin Burner for Schools with Low Cost. The Napkin Destroyer Machine produced by us help in fulfilling the safe burning requirements. These Napkin Incinerators are fabricated in compliance with the protocol provided by the specific Tamilnadu Pollution Control Boards. Dominating to their efficient designs and burning zones, our SARA Destroyer is widely demanded industrial, domestic and medical field (Particularly Maternity Hospital). 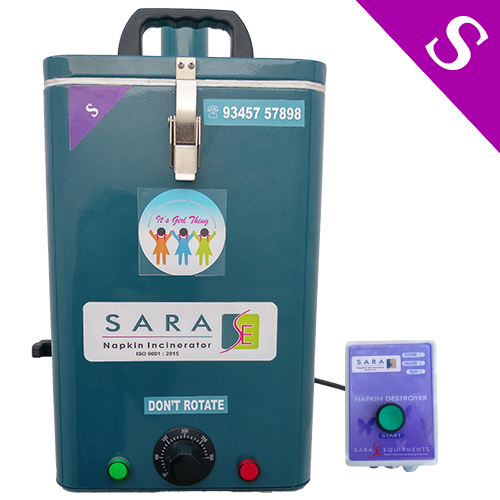 Sara Equipments - We have earned a sterling reputation in the industry for providing Sanitary Napkin Incinerator to our revered patrons. The offered sanitary napkin incinerators are used for incinerating the used sanitary napkins to produce negligible ash. These sanitary napkin incinerators are environmentally friendly and are operated with electricity. We specialized in handling customized orders owing to our dexterous professionals. Besides, these Sanitary Napkin Incinerators are available with us in varied specifications. 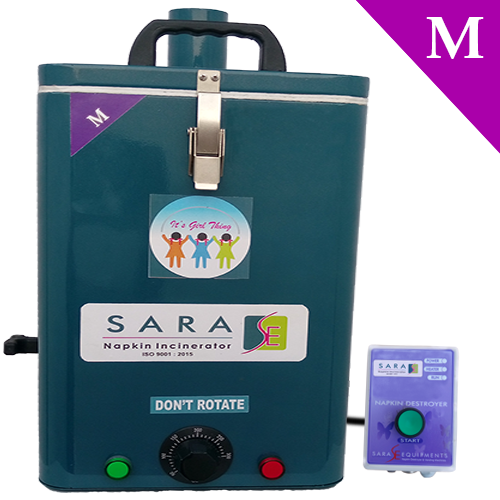 Sara Equipments - We have earned a sterling reputation in the industry for providing Menstrual Sanitary Napkin Disposal Incinerator Machine to our revered patrons. The offered sanitary napkin incinerators are used for incinerating the used sanitary napkins to produce negligible ash. These sanitary napkin incinerators are environmentally friendly and are operated with electricity. We specialized in handling customized orders owing to our dexterous professionals. Besides, these Menstrual Sanitary Napkin Disposal Incinerator Machine are available with us in varied specifications. Auto thermal cut off for the safety of use. By using our SARA Sanitary Napkin Disposal Machine easily dispose of soiled Napkins in a very scientific and hygienic way. Inside material made up of Stainless Steel covering for maximum longstanding, outside covered with Mild Steel but here 7 times coating process done. That’s why don’t bother about crust formation. Our fabricated construction is easy customization and separate components are easily marshaled at the site. That’s why our manufactured Sanitary Napkin Disposal Machine is liked by all. Sara Equipments - With immense market knowledge, we have been able to provide optimum quality Automatic Electric Napkin Incinerator under the brand name of SARA. Sara Equipments - With immense market knowledge, we have been able to provide optimum quality Menstrual Sanitary Napkin Pad Burner under the brand name of SARA. 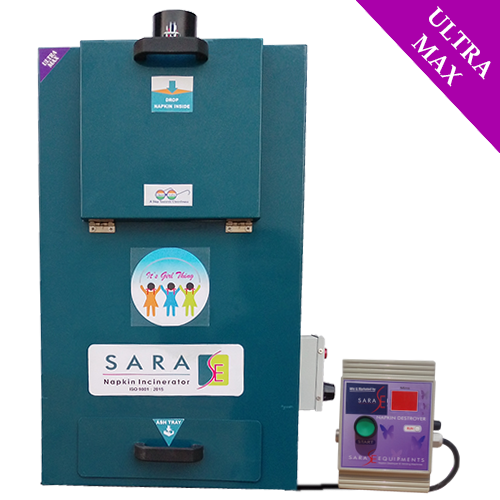 Sara Equipments - Our concern has acquired a distinguished market position in manufacturing, supplying and wholesaling a broad array of Automatic Sanitary Napkin Destroyer Machine which exhibits best and High Quality but Low Cost. Being compact in size, these Napkin Burning machines can be easily placed on the floor, in an open area or can be mounted on the wall of washrooms. Our Napkin Disposal Machines are fabricated under the guidance of UNICEF our offered machines ensure to function properly. 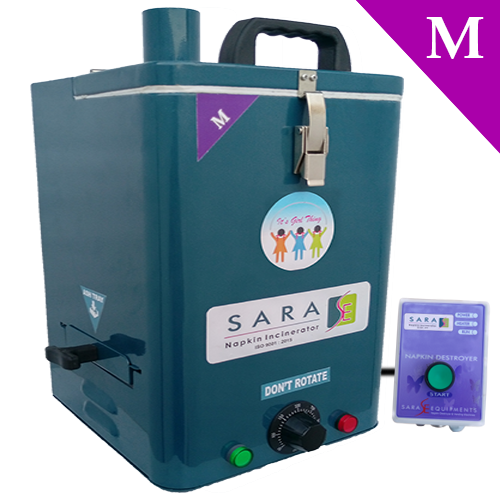 Sara Equipments - Our concern has acquired a distinguished market position in manufacturing, supplying and wholesaling a broad array of Wall Attached Sanitary Napkin Destroyer Machine which exhibits best and High Quality but Low Cost. Being compact in size, these Napkin Burning machines can be easily placed on the floor, in an open area or can be mounted on the wall of washrooms. Our Napkin Disposal Machines are fabricated under the guidance of UNICEF our offered machines ensure to function properly. 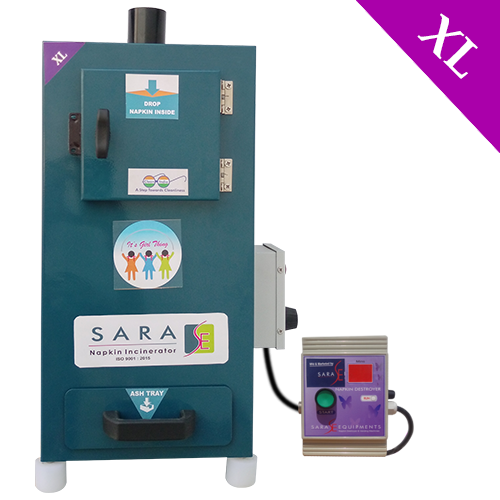 Sara Equipments - Being a Customer-centric firm, we are instrumental in offering a superior quality range of Sanitary Napkin Burning Machine with low cost which is thoroughly tested by our quality team before shipping. 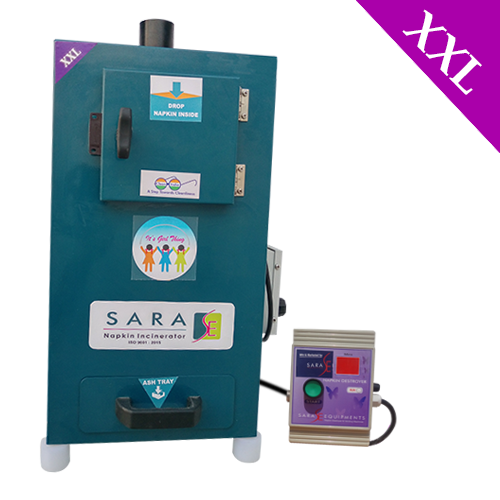 Our Sara Equipments is one of the leading Sanitary Pad Incinerator manufacturer, trader, seller, wholesaler, and exporter. It depletes lowest electric power in its class with wall mountable model. It has implanted automatic thermostat due to applicable thermal resistance. It completely burns the napkin with zero deposits. Modeled to meet norms of Central Pollution Control Board (CPCB). Our fabricated construction is customizable and separate components are easily marshaled at the site. Our discipline expertise has enabled us to offer the highest Quality range of Sanitary Napkin Burning Machine with Low Cost. The Burning Machine produced by us help in fulfilling the safe burning requirements. These Napkin incinerators are manufactured in obedience with the guidelines provided by the specific pollution control boards. Outstanding to their efficient designs and burning zones, these incinerators are widely demanded in the industrial, domestic and medical field (Particularly Maternity Hospital). With the help of this Pad Burning Machine, soiled Napkin waste can be quickly burned. Being a Customer-centric firm, we are instrumental in offering a superior quality range of Napkin Burning Machine with low cost which is thoroughly tested by our quality team before shipping. We are the well-known Best Quality School Based Napkin Burner manufacturer, supplier and traders having a team of experienced engineers for constant research and development to develop the cutting-edge technology in the field of used Napkin Waste Disposal. Our discipline expertise has enabled us to offer the highest range of Pad Burning Machine with Best Quality and Cheapest Cost in the market. The Napkin Incinerators produced by us help in fulfilling the safe burning requirements. These Napkin incinerators are manufactured in obedience with the guidelines provided by the specific pollution control boards. 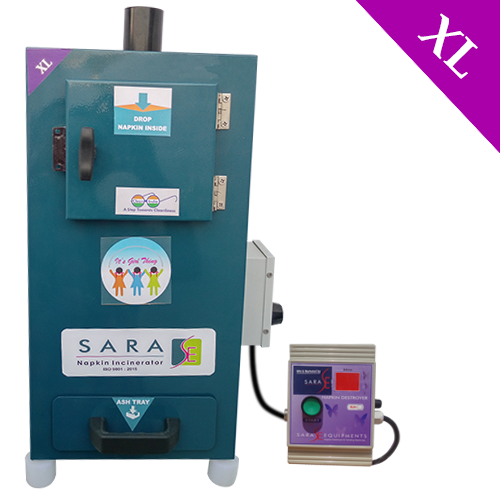 Our Sara Equipments is one of the well-known manufacturer, trader, supplier, wholesaler, and the exporters of Large Model Sanitary Napkin Incinerator Machine for Public Rest Rooms under the brand name of SARA. Our fabricated Pad Disposal Machine is mainly applicable in school, college, medium scale industries, and small the hospital. Note: Above mentioned price is the starting model price of the product; prices may vary according to the size and structure, and number of machines. 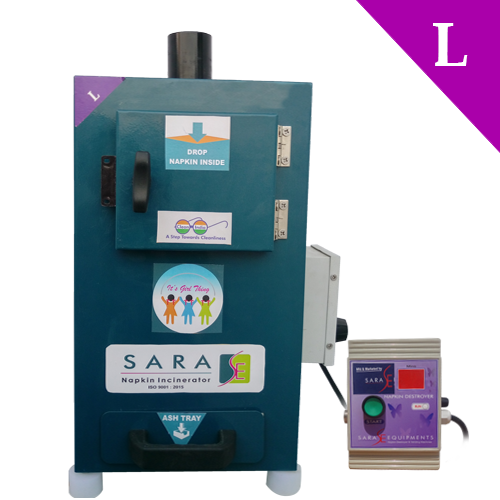 Sara Equipments - Our concern has acquired a distinguished market position in manufacturing, supplying and wholesaling a broad array of Auto Cutoff Sanitary Napkin Incinerator Machine which exhibits best and High Quality but Low Cost. Being compact in size, these Napkin Burning machines can be easily placed on the floor, in an open area or can be mounted on the wall of washrooms. Our Napkin Disposal Machines are fabricated under the guidance of UNICEF our offered machines ensure to function properly. 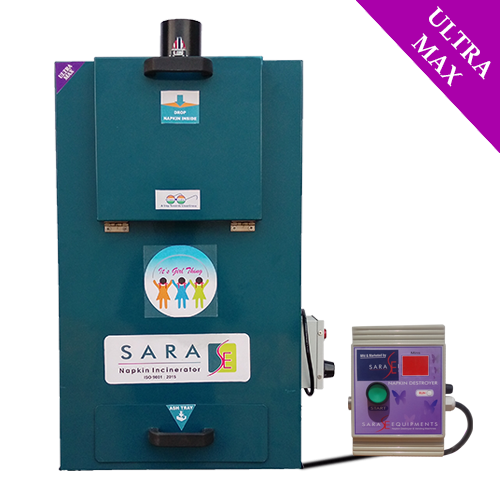 Sara Equipments - With immense market knowledge, we have been able to provide optimum quality Large Model Sanitary Napkin Disposal Machine under the brand name of SARA. 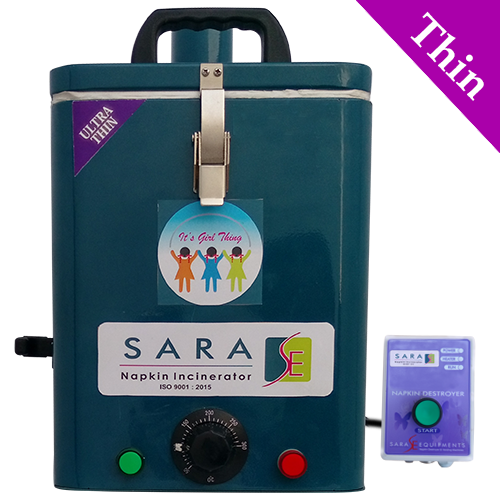 Sara Equipments - Our concern has acquired a distinguished market position in manufacturing, supplying and wholesaling a broad array of Portable Sanitary Napkin Disposal Machine which exhibits best and High Quality but Low Cost. Being compact in size, these Napkin Burning machines can be easily placed on the floor, in an open area or can be mounted on the wall of washrooms. Our Napkin Disposal Machines are fabricated under the guidance of UNICEF our offered machines ensure to function properly. 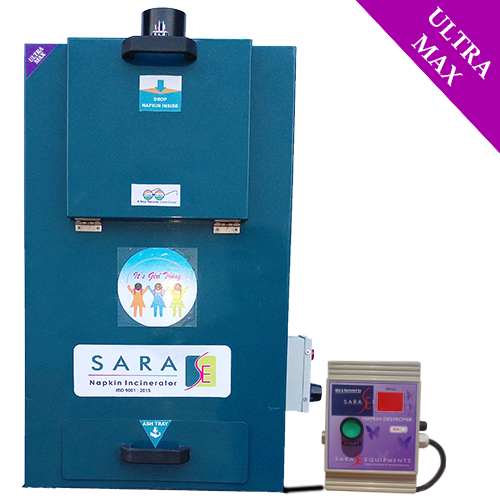 Sara Equipments - Our concern has acquired a distinguished market position in manufacturing, supplying and wholesaling a broad array of Wall Mounted Sanitary Napkin Destroyer Machine which exhibits best and High Quality but Low Cost. Being compact in size, these Napkin Burning machines can be easily placed on the floor, in an open area or can be mounted on the wall of washrooms. Our Napkin Disposal Machines are fabricated under the guidance of UNICEF our offered machines ensure to function properly. 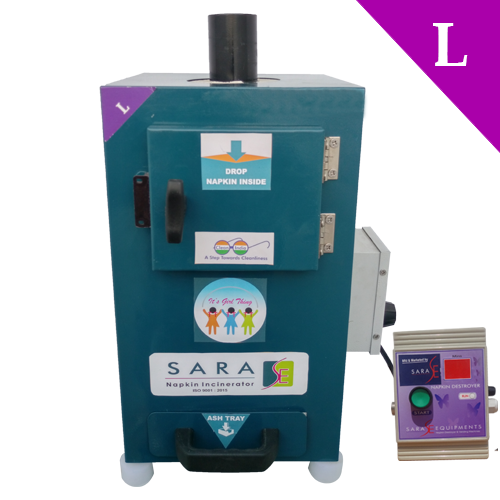 Sara Equipments - Being a Customer-centric firm, we are instrumental in offering a superior quality range of Good Performance Sanitary Napkin Incinerator with low cost which is thoroughly tested by our quality team before shipping. 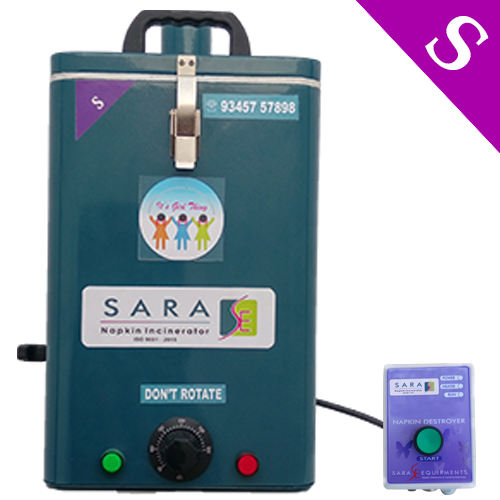 Sara Equipments - We have earned a sterling reputation in the industry for providing Sanitary Napkin Destroyer Machine to our revered patrons. The offered sanitary napkin incinerators are used for incinerating the used sanitary napkins to produce negligible ash. These sanitary napkin incinerators are environmentally friendly and are operated with electricity. We specialized in handling customized orders owing to our dexterous professionals. Besides, these Sanitary Napkin Incinerators are available with us in varied specifications. • Heater of high power makes the temperature rise quickly and improves the efficiency. • Double stage computer programmed control panel gives Long life for heater and reduce the electricity bill. • Available with size of 50, 100, 200 and 500 napkins per day. Note: Above mentioned price is the dealer model price of the product; prices may vary according to the size, number of machines and structure. 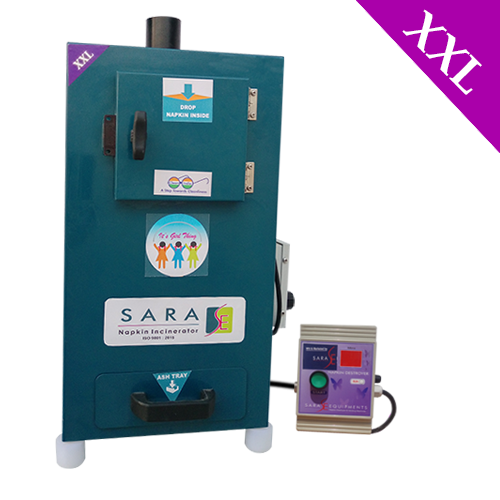 Sara Equipments - We offer a wide range of Sanitary Pad Burning Machine in the brand name of SARA. These are available at a very competitive price in the market. Immediate disposal of soiled Napkins in a very scientific and hygienic way. Inside material made up of Stainless Steel covering for maximum longstanding, outside covered with Mild Steel but here 7 times coating process done. That’s why don’t bother about crust formation. Looking for “Sanitary Napkin Burning Machine”?